Americans for Democratic Action is the nation’s most experienced organization committed to liberal politics, liberal policies, and a liberal future. ADA was founded by Eleanor Roosevelt, John Kenneth Galbraith, Walter Reuther, Arthur Schlesinger, and Reinhold Niebuhr shortly after FDR died. Our goal then? To keep the New Deal dream of a fair and prosperous America for all alive for generations to come. With Donald Trump creating a chaotic atmosphere at home and abroad, ADA remains a key player in protecting progress and building for the future so that the dream can come true. We are working with allied groups in Washington and in states even as we build and mobilize our grassroots network across the country. Ask any of our recent presidents such as Barney Frank, John Lewis, Jim McDermott, or Charles Rangel; they certainly think so. The great liberal lion, Senator Edward Kennedy, credited us as the group behind passage of the latest increase in America’s minimum wage. We’re certainly proud of that success – but it’s just one of the many things we’re doing, because we’re not a single-issue group. Instead, we’re a group with a single vision, and many issues. 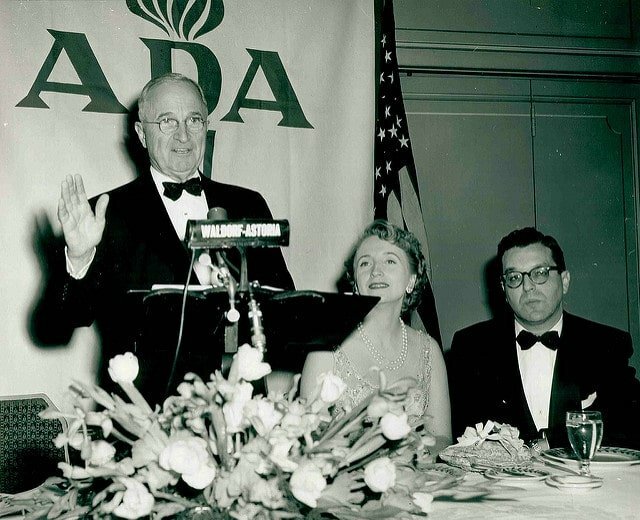 ADA has played critical roles in every Democratic presidential campaign since Harry Truman’s, and has provided scores of senior advisors to Democratic Presidents, Senators, and Congressmen over the years. And it’s consistently been on the forefront of cutting-edge issues. It pioneered in the fight for civil rights in the 1940s and 1950s, for education reform and serious anti-poverty programs in the 1960s, for environmental protection in the 1960s and 70s, and for fair trade and workers’ rights in the 1990s. It fought just as hard against George Bush’s invasion of Iraq as it did against the war in Vietnam, and it was a vanguard in opposing the unjust economic and social policies of Richard Nixon, Ronald Reagan, and both George Bushes, not to mention the sorts of Wall Street deregulation that brought us in 2008 the worst financial crisis since the 1930s. With thousands of members, and active local chapters across the nation, ADA works in Washington as well as state capitals and major cities from California to Massachusetts. Based in our Washington headquarters, senior ADA staff lobby, monitor, and contribute support (financial and volunteer labor) to scores of progressive Congressional candidates each election cycle. (That network is important: it meant we were among the very first groups to support Barack Obama’s Senate race in 2004.) Using its Congressional Vote Ranking – the first-ever such ranking, and still the gold standard in rating progressive candidates – ADA leverages influence and support in strategic coalitions with other progressive groups and donors. Our lobbying philosophy is based on democratic action – motivating our grassroots members to lobby their Senators and Representatives as constituent-advocates. Using this philosophy, ADA continually strives to push for democratic and liberal values and ideals in American policy. 2018 – present State Senator Art Haywood Note: From 1947 to 1973, ADA’s top elected officer was called National Chairman; the title was later changed to National President.